In designing a website, the homepage is always the best place to start. It is also one of the best places where you can place lead-generating tactics. Your homepage is primarily entrusted to generate most of the traffic you’ll earn. 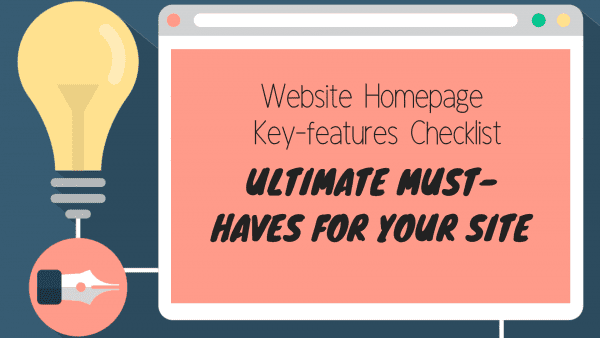 Despite the grave importance that homepages have, not all sites can optimize them well. One of the main reasons as to why many homepages fail to perfect their expected purpose is because they are not made with this purpose in mind. Homepages should be built with the mindset that it is not merely there to be a landing page, but rather as a multi-purpose page that can draw in traffic, that can inform visitors, and can win conversion. The logo of your organization should be placed on your homepage, and it should be the first thing that your visitors should see on your site. As a general rule, your logo should be placed on the top left portion of your site. Multiple studies have proven that this is the best location for logos. Make sure that you provide your logo enough white space around it so that it can stand out. Also, don’t make your logo too big as this will not positively affect its appeal regardless of how amazing the logo is. Your homepage should contain a headline that tells in brief what your site is all about, or what your business offers. The headline may be short, but it is an essential copy that you should not miss out on the opportunity to optimize. Make sure to keep your headline short and crisp though. A sub-headline is used to give more force to your headline. It reinforces what your headline says by briefly explaining it. Ensure that you use large, readable text for both your headline and sub-headline (with the headline being more massive of course) so that your visitors would be able to notice it immediately. This also helps mobile user a lot as they would not need to zoom in to be able to read what should be some of the most important text on your site. You should make use of your CTAs to lead your customers down the sales funnel. Your CTA buttons should be designed to be noticed so its color should be in contrast with the rest of your site, but it should still sit with the other elements well. Also, keep your CTA buttons’ copy short, ideally five words or less. As most of your visitors are likely to be visual by nature, it is a good idea to include a supporting image or video on your homepage. This further places your offer in the minds of your visitors. You should select images that can invite your visitors to do the desired action. Always make sure that you only use high-quality images, but make sure to keep it light. Also, make strategic use of alt-text to boost your search engine optimization efforts. It is ideal to highlight the benefits that your site offers. Placing this part on the homepage is an excellent idea as it capitalizes on what you offer, and how you compare against the competition. It is also a good idea to put in some social evidence on your homepage. Sure, you can always claim that you are the best at what you do, but without any form of social proof, it is hard to prove it. With social proof, your visitors can be convinced that what you promise is true. When written by actual customers, the results are amplified. New customers almost always bank on the experience of others who had tried the product or service being offered before trying it themselves. Your navigation scheme plays a crucial role on your site, and not just on your homepage at that. However, as your homepage is almost always the first thing that your visitors will get in touch with, and with all the elements on the homepage that we’re trying to fit in, it is essential to strategize your site navigation very carefully. While there is on one navigation scheme that works for all, what can be done is to conduct user testing to make sure that your site’s navigation works intuitively. The goal here is for visitors to be able to go to their desired page with not much hassle. Your homepage should also be home to winning content. Strategically place an excellent content offer such as a guide, or if you have, a whitepaper or an e-book. It is always a good idea to provide something that your visitors can take for free as this can further invite them to a purchase on your site later on. Most of the successful online marketing blogs include social media sharing buttons on their homepage. You can also use this in your website as it increases the traffic on your site. While we already talked about calls-to-action, there is such a thing called secondary calls-to-action, and they are also essential, especially for the homepage. Your primary CTAs are usually placed above the fold. Meanwhile, secondary CTAs are placed below. With more and more website becoming long-form, users are now expected to scroll down, so it is essential for you to put in messages inviting the desired action on lower parts of your website too. Aside from the content offer mentioned in item 9, it is also great to put in other free resources on your homepage for your visitors to take advantage of. Many people find the content very helpful, but only when it is substantial and well-crafted. Make sure that you don’t only focus on being a good salesman, but also as an expert in what you do. With that, make sure to be active in maintaining a resource center where your visitors can get valuable insights from you. It is also a wise move to display awards and recognition that you may have earned to help invite more trust from new customers. This testifies to specific quality and can assist in winning sales. Awards and recognition include testimonials from credible personalities and agencies, trust seals, statistics, and mentions in the press. It is also necessary to add trust indicators to your website. In that way, you’ll be able to gain the trust and build credibility with your customers. Choosing the right and reliable web hosting provider to your site is the first step in adding trust indicators. Your homepage indeed plays an indispensable role on your site. It is the gateway to the rest of your page and is the first thing that your potential customers will touch base with, and it should be able to do its job of winning them at first sight. First impressions do matter, and that’s the exact role your home page will have to play. So make the best out of the 12 elements mentioned above, and you’ll give your site’s home page a significant boost.